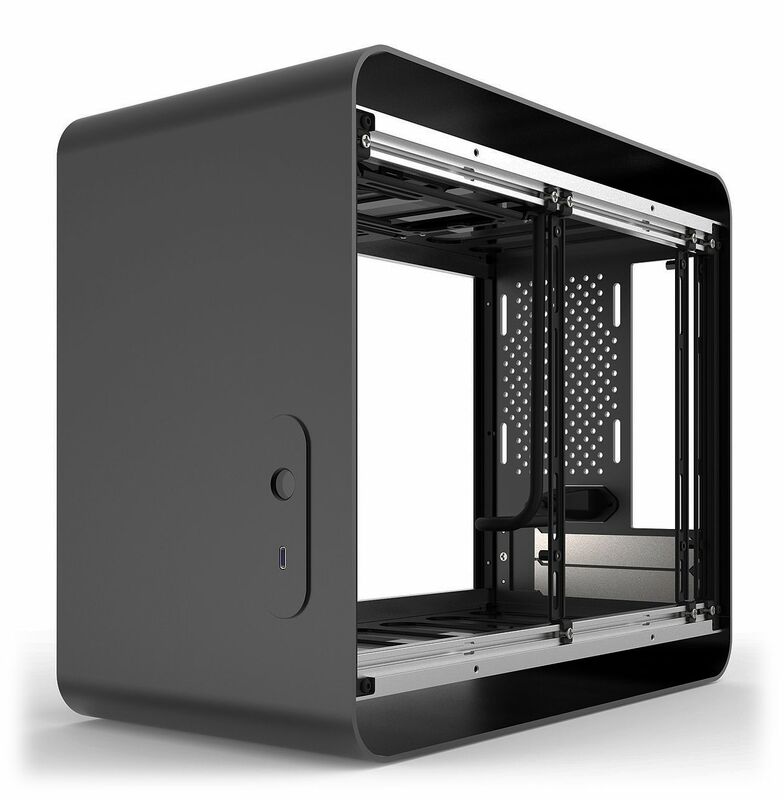 The DA2 is a compact ITX case designed to strike a balance between size and compatibility, allowing high performance components to fit comfortably in a small form factor space. Streacom is no stranger to the small form factor (SFF) PC case - its been their focus since day one, even going so far as to develop their own NanoPSU, which was an essential component in reducing size to the absolute minimum. This resulted in extremely compact cases such as the F1C which measures just 197x 197x77mm but with such a compact design comes limitations. Beyond the requirement for a custom PSU, compromises include reduced CPU cooler size, low end or no discrete graphics card, limited storage, lack of water cooling and restrictive fan cooling - all resulting in complicated builds that lower performance and higher operating temperatures. Streacom are not alone in trying to compress a chassis footprint. There have been admirable attempts by other manufacturers to optimise the layout and space which has created some incredibly compact cases that still offer close to full size desktop performance. Unfortunately they too suffer from component limitations and relatively challenging builds. They also gravitate towards a somewhat uninspiring and generic oblong box design which is an unfortunate but understandable consequence of focussing on size optimisation and the pursuit of the title "world's smallest gaming case". With all this in mind, Streacom drafted a mission... to create a SFF case (under 20l) which would by definition be compact and therefore space efficient, but also component friendly and incredibly versatile without sacrificing the element of design. Of course, being a Streacom product, design and quality would be part of its DNA but this time with extra emphasis on supporting a wide range of standard components and build choices. So here it is, the fruits of their labour, the DA2... it won't win any prizes for being the smallest case on the market but it does set a new benchmark in terms of size vs compatibility and versatility. So what makes this case different? Streacom thinks it starts from an easily overlooked but fundamental difference. Unlike many companies on the market, Streacom don't use a 3rd party to manufacture, everything is done in-house, so instead of reusing the same tooling or following a forced design path, they have the freedom to explore a different approach and create something new. Of course there are brands that do their own manufacturing but they tend to be large legacy companies that are slow to push for change and content to remain in their comfort zone. Streacom's innovation is also driven by the inherent constraints of the materials they use. Aluminium might be cheaper than steel but that is the raw cost and only half the story as processing and finishing costs for aluminium are much higher. This forces Streacom to constantly rethink how their products are engineered in order to stay competitive. With the DA2, Streacom developed a new technique for assembling the outer body and internal frame. This eliminates the need for bonding studs to the aluminium, resulting in an improved finish and the ability to re-orientate the outer frame, adding to the flexibility and customisation potential. 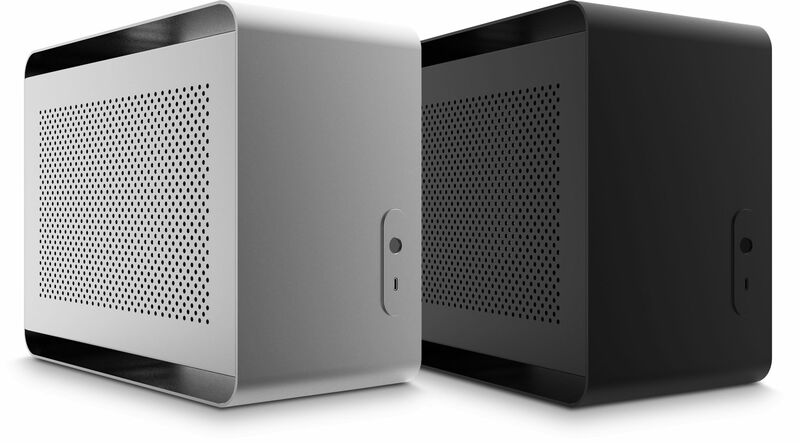 It's easy to assume that just because a case uses aluminium and looks great in photos, it's going to have the same look and feel when it's sitting on your desk in the flesh. 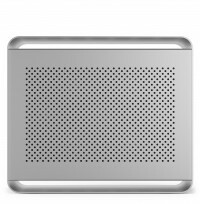 Whether it's using rivets instead of screws, 1.5 instead of 3 mm thick aluminium, or a brushed finish instead of sandblasted. Those seemingly tiny details add up to vastly impact the real world experience. For example, take the power button. It is made from glass and features a discrete pinpoint of centred white light (sorry, no RBG, deal with it!) designed to allow for different orientations and looks subtle and sophisticated. Using glass also gives a better tactile feel and contrast from the aluminium body. 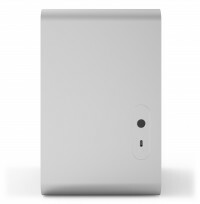 The power button is mounted on what Streacom call the front I/O which is milled from a solid block of aluminium and includes a single USB type-C connector (finally a USB socket that looks good enough to place on the front). The entire assembly has been designed with future proofing in mind. Type-C might be all the rage, but tech changes all the time, so the front I/O is designed to be removable and interchangeable. Should USB change, you wont need to replace the entire case, Streacom can simply fabricate an updated front I/O or even an entirely different set of ports if there is a demand for it. The typical approach to the expansion card support is to punch a flap in the rear panel which form the opening and acts as the screw fixing post. To cover the hole, another "L" shaped bracket is fabricated and screwed to the back panel. It's an industry standard and simple solution, but it's visually unappealing and the cost cutting easy option. Just like the front I/O, the PCI support is also milled from a solid block of aluminium, so even though it's on the back of the case and arguably out of sight, Streacom didn't cut corners on the design and build quality. These seemingly insignificant differences and the refusal to compromise cement Streacom's attention to detail. When combined, such factors set this case apart and why it's difficult to compare it on spec alone. Dedicated bays for drives, fans, radiators, etc are great for making builds fast and easy but terrible if you want to optimise the usable space and create a truly customisable platform. When Streacom created their last two cases, the F12C and the DB4, they pioneered the use of something they call the universal bracket. 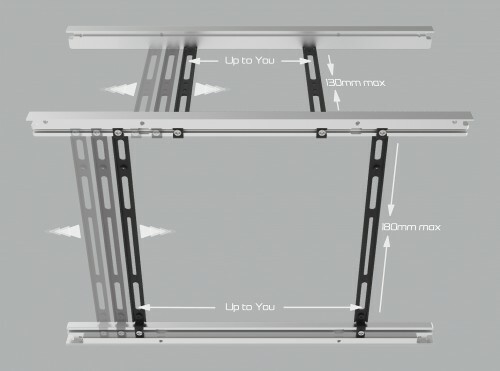 The DA2 also utilises this innovative approach with a track that is integrated into the frame, allowing the brackets to be fitted anywhere along the sides of the case. 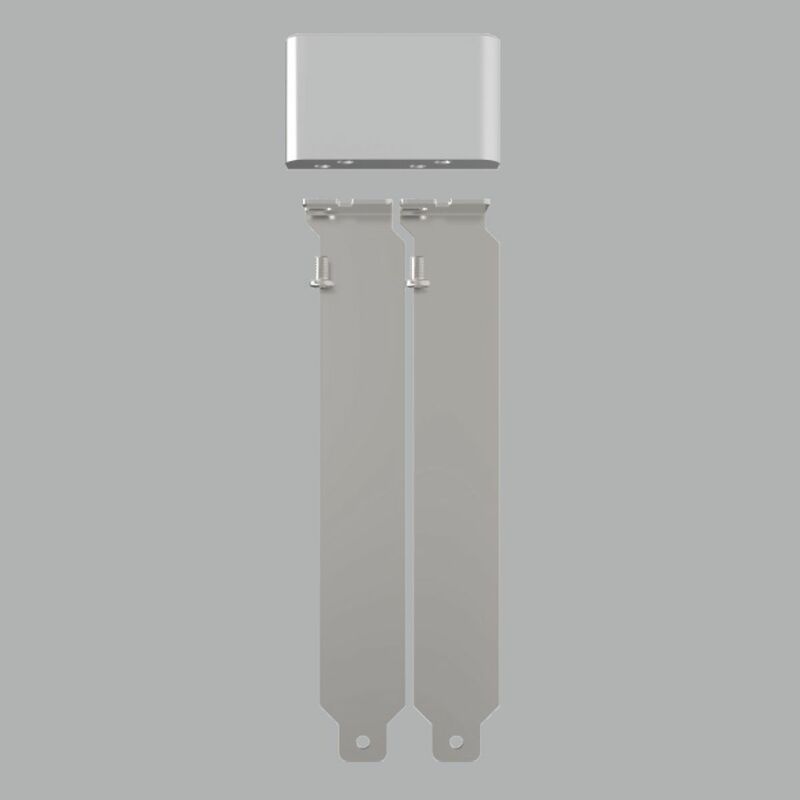 There are two sizes of universal bracket, the vertical (on the sides) and the horizontal (top and bottom) that allow virtually anything with mounting holes to be fitted. Other than the motherboard and expansion card (which can still be flipped if needed), every component can be repositioned anywhere along the tracks, giving unprecedented levels of customisation. A picture paints a thousand words and the examples below will give you an idea on the possibilities. To keep the components and layout easy to see, the motherboard is not shown since that is a given and will always occupy the same area within the case. Example 1 - A typical build using a compact to mid-size GPU, SFX-L PSU, 140mm tall CPU Cooler, 1x 3.5" + 2x 2.5" drives and 140mm intake fan for additional case cooling. Example 2 - Something with a bit more kick, a full size GPU (card shown is 270mm in length), SFX-L PSU, 240mm radiator and 2 x 2.5" drives for storage... game on. Example 3 - Whilst the case was optimised for SFX, it can even accommodate an ATX PSU together with a mid size GPU (up to 225mm in length), 140mm radiator and 1x 2.5" drive. 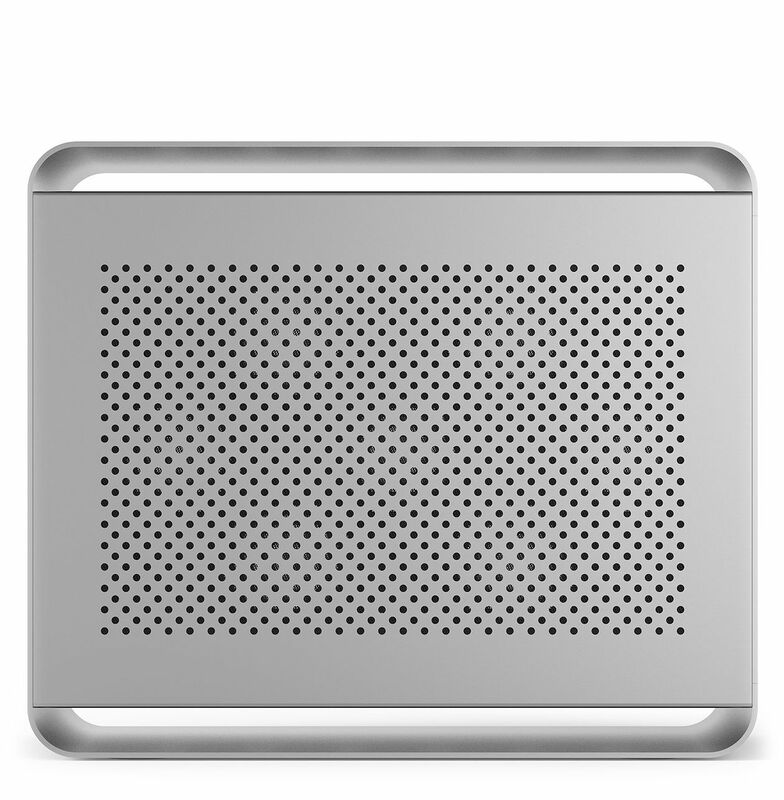 Example 4 - With the use of an additional drive bracket, you could create a NAS with 6x 3.5", 8x 2.5" drives and some fans for cooling. Example 5 - Maybe not the best use of space, but this is how you could fit a 180mm fan for a low RPM low noise setup. Example 6 - Mounting the SFX PSU towards the rear opens up a large space at the front of the case, ideal for all kinds of exotic mods! 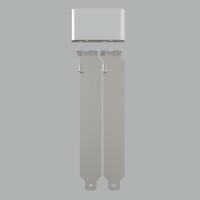 This examples shows 2x 140mm radiators. Coming from a background in fanless cases, Streacom thought it would help if they looked to the competition for inspiration and noticed a trend, "restrictive front panel airflow". Not content with simply imitating, they took it to the next level, the DA2 has ZERO front panel airflow. Jokes aside, there really is no front panel airflow but the good news is that every other panel is extremely well vented, with over 2000 precision holes on the sides and back panel. The upper and lower panels feature mesh grills and whilst they are partially concealed by the outer frame, (which is a character design feature) the opening is wide enough to be unrestrictive. 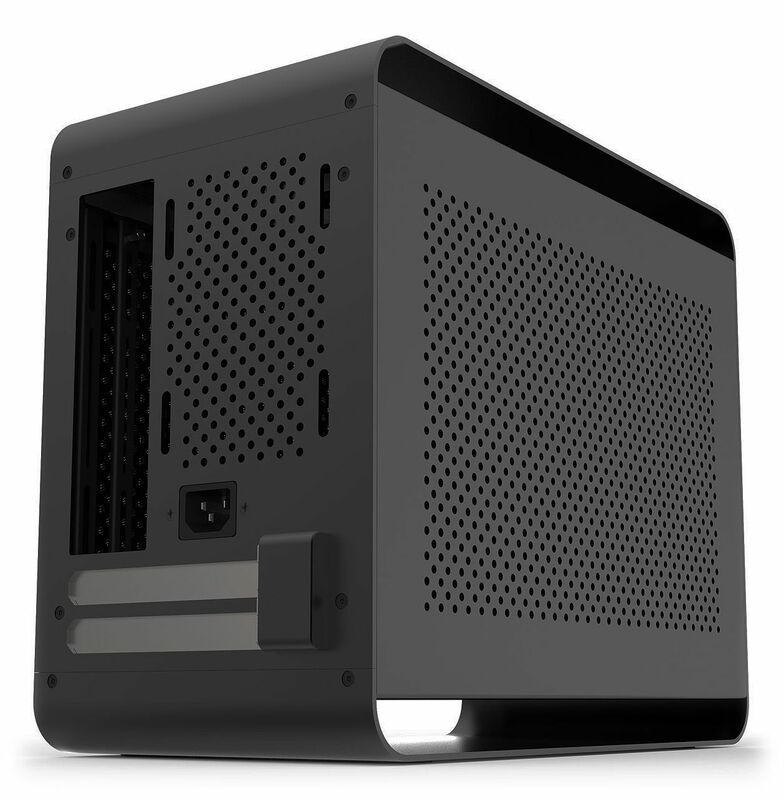 This results in excellent airflow from every side of the case (other than the front). It's worth considering that not many cases have such great clearance for lower air intake. The universal brackets accept anything from a 60mm fan, all the way up to a 280mm radiator, with any size in between, so your high performance components are not going to suffer from overheating. Let's address the elephant in the room, no there are no supplied fans! Why? This is because there are so many different configurations, there really is no correct fan to include. So supplying a fan (or two) just doesn't make sense. If portability is what you need, "smaller is better" is a hard argument to challenge but when it comes to a typical desktop setup, the argument is not so clear cut. With the current smallest gaming capable ITX cases coming in at 7.5ℓ, it's easy to think that 17.5ℓ is going to take over your desk, but let's put that 10ℓ difference into perspective and consider the real world differences. In the image below there is a difference in depth of just 23mm (340-317), which is really negligible and won't have a noticeable impact on desk real estate. Streacom needed this extra 23mm to allow for longer graphics card and the use of an ATX PSU which makes it worthwhile. Height is the biggest numerical difference, with the DA2 being a whopping 81mm taller but unless your PC is going on a shelf, everything above the case is dead space anyway, so does it really have an impact? 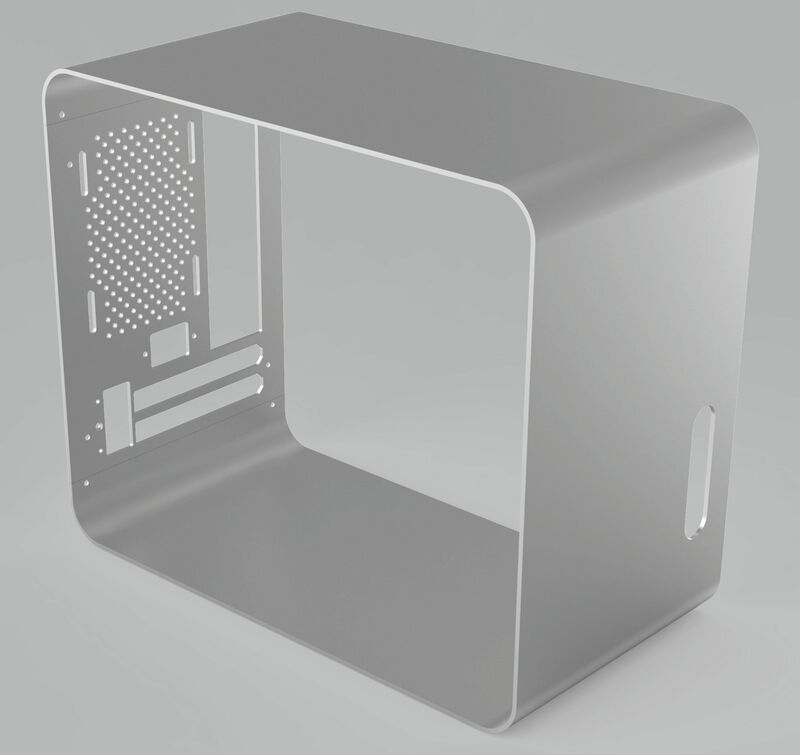 It's also worth considering that 52mm of that height difference is open space at the top and bottom of the case which forms part of the design and contributes to the excellent airflow. Streacom like to think it's a sensible tradeoff for adding that extra airflow. Width is the main practical difference in terms of desk space as that accounts for an additional 68mm which is about the diameter of a soft drink can, but that sacrifice gives you 145mm of clearance for an air cooler. Again it's a carefully considered trade off if it means your system is going to run cooler and quieter. 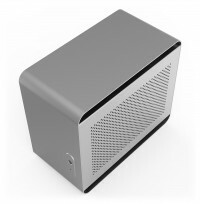 Noise is going to be a far larger distraction than size, especially for a case designed to be placed on your desk. 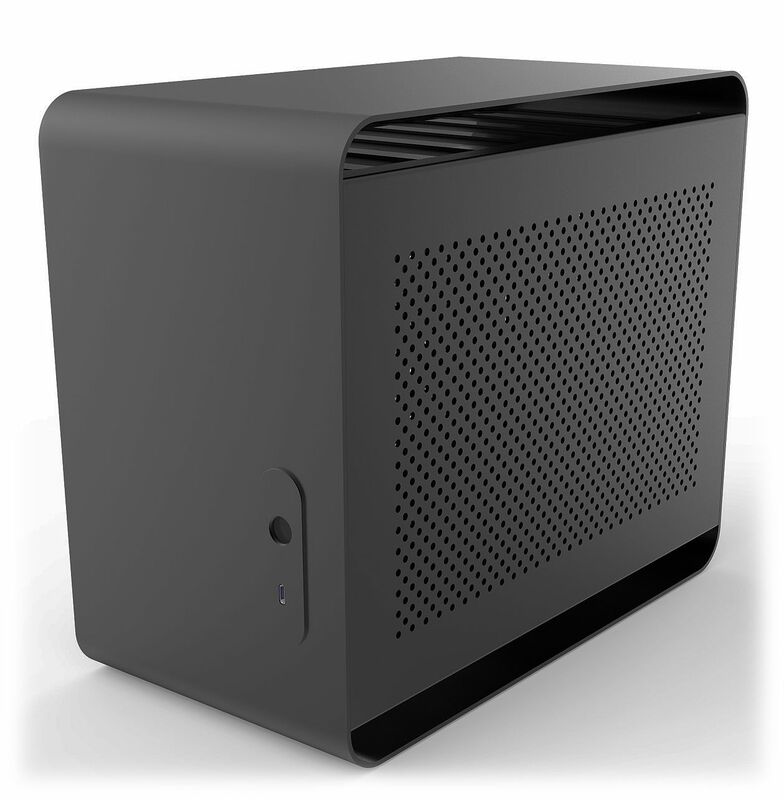 In short, the DA2 is a compact ITX case designed to strike a balance between size and compatibility, allowing high performance components to fit comfortably in a small form factor space. Its unique approach to mounting components makes the case incredibly versatile, greatly improving the range of hardware and type of systems it can be used for. Visually the DA2 is another testament to what Streacom does best... minimalise... innovate... timeless design. To whet your appetite, here are some photos on the DA2 in all its glory. Click each image to enlarge! We have a number of fully built system based around this amazing chassis. You can choose from an air cooled or silent Intel system or an air cooled or silent AMD system! 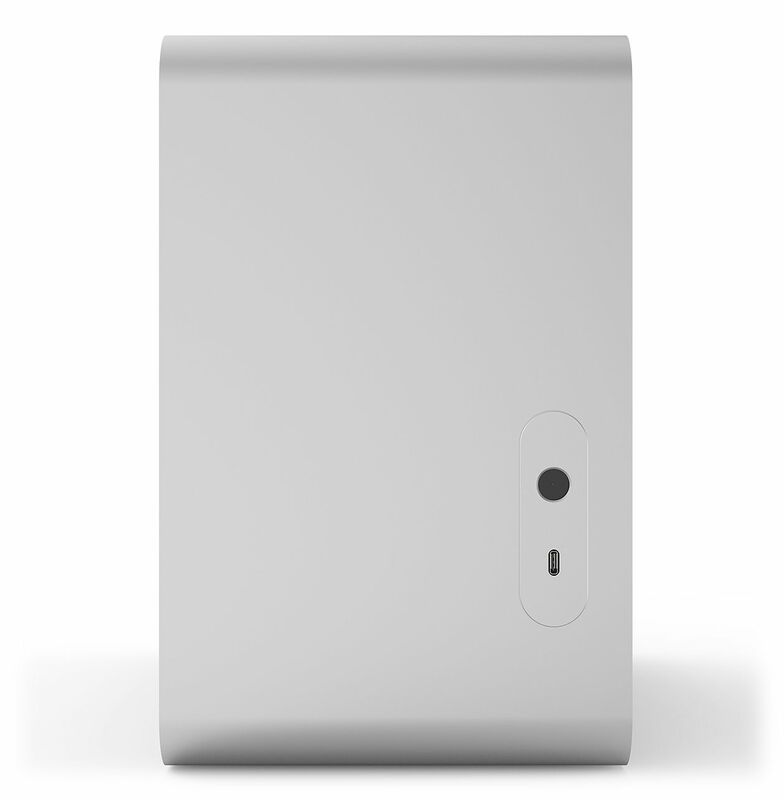 Drive Support 3x 3.5" or 8x 2.5"
First, the case looks and feels very robust and well thought. The free moving brackets do offer a lot of customisation options. The side panels pop off easily, so the dust filters are easily accessible. Overall a very well thought, elegant and solid case. It does accommodate a 280mm AIO, but the dimensions do matter! For instance, a Corsair H115i PRO fits just into the case, leaving no room for an exhaust fan. You also have to take into account the depth of the radiator, fans, and pipes. It will be a tight fit. I also recommend using a SFX PSU when using an AIO, ATX won't fit, and SFX-L won't leave room for the power cables unless you don't intend to use a full length GPU. Building in this case requires a little thought, especially where to route the various cables, but it's definitely possible. A modular PSU is recommended, one such as Corsair SF where cables are insulated per wire so you can flatten them the best way definitely helps. 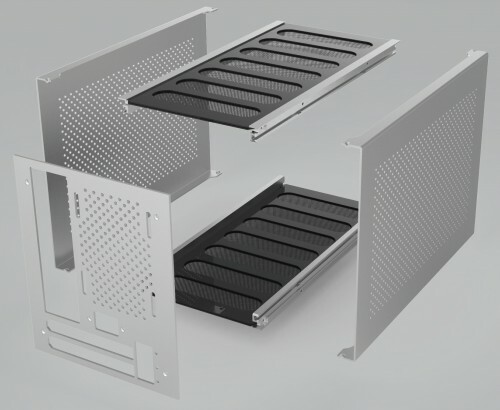 Dust filters could be better, they impede airflow due to their "little holes" design instead of a "grid"/"net" seen on usual dust filters. Also, on my own case, there were little adjustment problems (one side panel isn't perfectly adjusted to the front, and the screw holes for the PSU were a bit misaligned), which is very minor but still hardly normal for a case in this price range. Still, it remains, all in all, a very good case, where you can fit a very powerful setup while having good thermals despite the air filters. It's compact, solid, not that hard to build in given the dimensions, and feature rich. 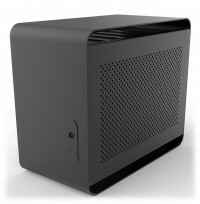 The almost perfect mini-itx case! Great looks, high quality and solidly build, and it really fits a 280mm AIO! Would definitely recommend to anyone looking for an unconventional, beautiful and well built case. Its design makes it an easy piece to show but also blends in style perfectly anywhere. I managed to cram an i5 9600k cooled by a NH-L12s AND my 1080 cooled by a 280mm kraken X62 (mounted with a Kraken G12)! With a silent fan profile the temps stay below 60°C even in poorly optimised titles and the rig is barely audible more than 1 meter away. The side holes allow for breathability, although there could be more of them or made a bit bigger to remove any airflow restriction. The minus 1 star go for: the plastic holders from the dust filter which are very brittle, the dust filters in themselves which are quite airflow restrictive (@Streacom: please take example on Silverstone for those, they have thin and non airflow restrictive ones), and the rather unfortunate power supply extension cable and PSU cables placement which make the build quite challenging. This may look like a lot of minus, but I really had to look into the details to find any negative aspects to this case, and this is written with the hope that Streacom will one day offer a V2 correcting those minor quirks.